Little Blue Tower ~ Welcome, fellow Traveler. 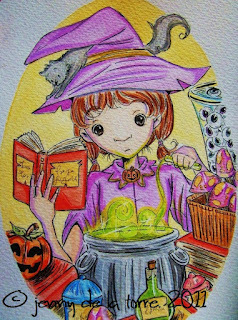 Wander into the art of *Jennifer De La Torre*: "Recipe"
The final Witch Apprentice card is finally done! With Halloween being my favorite holiday, I'll likely be making more of these in the future. My favorite section of the entire piece. Nothing can break her concentration, not even a jar full of eyeballs!